This website showcases the artwork of Michael Lovejoy. Michael is based in the North East of England, and has been sculpting and illustrating professionally since 2001. He has produced a wide variety of sculpts, from extremely small scale wargames miniature figures, through to life-size animals, as well as designing jewellery and medallions. Michael's award-winning work has featured in a number of international magazines, and his sculptures are on display in eleven countries. 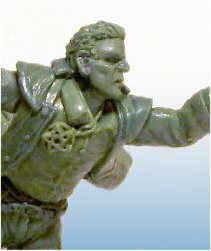 Important note:Unfortunately, Michael is unable to take on any more commissions at the moment, as he is fully engaged sculpting for the Oathsworn Miniatures range.